Whether you’re working with a large distributed team or overseeing a small group of developers at a startup, project management is a juggling act by definition. The job of project management is all about keeping track of progress, resource allocation and deliverables. This juggling act can be a challenge even for seasoned project managers – quite simply, there are just so many things to track. That’s where project management tools come into play. Basic project management can be performed with nothing more than email and a spreadsheet, but the task is greatly improved with software that both tracks all aspects of a project and visually represents how the project is evolving. The visual component is especially important because it helps managers see at a glance how the project is moving forward. There are many ways that a list of top data visualization tools for project management might be selected: purpose-built add-ons for existing project management software, all-in-one solutions that both track and display project status, and enterprise-grade data visualization tools. For most project managers, simple all-in-one solutions represent the sweet spot of visualization and ease of use. So we’ll focus on those tools that are both visual and complete solutions unto themselves. If you need to manage and visualize projects but don’t require advanced functionality that is unnecessary and clutters your project management, Quire might be your tool of choice. Quire works by letting you map out tasks and thoughts in a simple to-do list format that can easily be rearranged and assigned to team members. Once tasks have been defined in the app, you can visually organize and assign these tasks using a Kanban board built into the system. The software makes it easy to flip between task lists and the Kanban board as needed. The beauty of Quire is that it also offers a number of visual representations of your task list that you can choose from, including pie charts, project summaries and graphs. All the basic visual representations are there except for Gantt charts, the one strike against this platform. 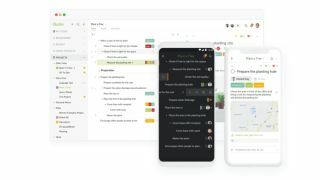 Overall, though, Quire delivers a streamlined project management interface that nicely strikes a balance between simplicity and power. There are many ways in which you can visually organize your project. If your preferred style is flowchart-based organization, you’re going to love Casual. Instead of Kanban boards or Gantt charts, Casual is built exclusively around a single flowchart interface where you organize projects by drawing lines between tasks, and assign team members to each step in the flowchart. Each team member gets a task list based on the flowchart, but essentially project managers that use Casual track progress through the single-pane flowchart. Casual is easily the best solution if you prefer the flowchart format and have a project that can be represented in that format. If you want a range of charts and other ways to organize or manage a large team, however, Casual is not for you. Asana is one of the web-based project management leaders, and with good reason. You get most of the project management tools you expect with the platform, including task lists, Kanban boards, calendar format, conversations and Gantt charts. You manage projects by entering tasks on a task list, with manual or auto assignment to team members. A Kanban board makes organization of these tasks easy, and a timeline (read: Gantt chart) visually shows the progress of the project. While task management is quite visual, and most project managers will feel at home on the platform, Asana lacks a chart dashboard for tracking progress metrics in other visual representations. So this is visual management, but it isn’t strong on visual data representation. If Gantt charts and dashboards are your thing, Wrike should be on your project management shortlist. Wrike makes it easy to create tasks and workflows, and then manage these tasks visually in a Gantt chart or calendar format. One feature that’s great about Wrike is that you can visually create custom workflows for your project. Data visualization is also a strong point for Wrike, which lets you set up custom dashboard items that visually show the progress of key project metrics. In one quick view, you can see the status of each area of the project. Furthermore, Wrike is highly scalable, with many integrations to other platforms and support for large teams. If you want everything in your project management software, including a host of data representation options, Targetprocess is for you. Taking a dashboard approach but also working in Kanban and Gantt chart formats, Targetprocess basically gives your project the full suite of features. Complex task lists can be configured and rearranged, and it comes with a multitude of data representation views that can be added to the dashboard for quick progress assessment. Targetprocess is geared towards agile software development projects, and it can be overwhelming in its feature set and clunky in its interface, but this solution visually represents data in more ways than rivals, and does everything a software project manager could want.